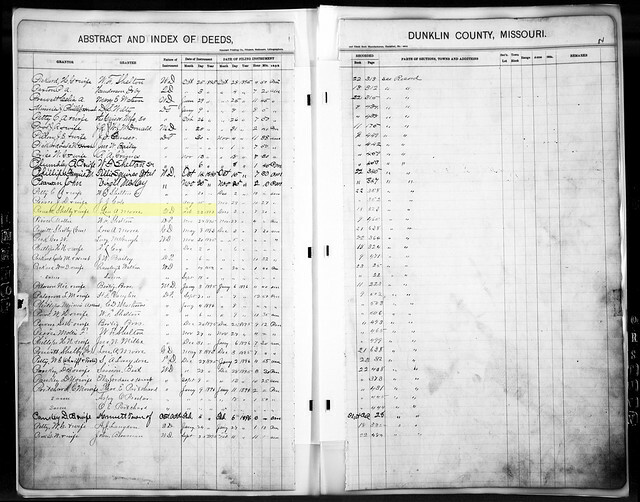 One of the research activities in which I have been engaged recently is perusing the images available for Dunklin County on FamilySearch.org. These images have been digitized but never indexed, so I have to go through each image individually and look for names that I know are connected to our family. 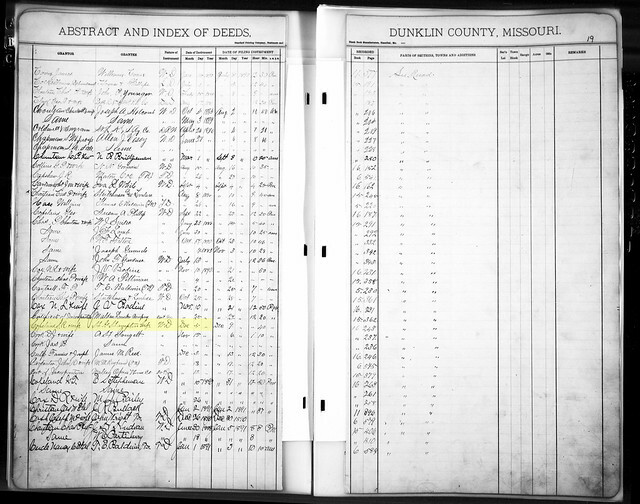 In the process, I’ve found some really interesting connections between the Copelands and other Dunklin County families, and I thought I would share some of them with you. The first item involves Shelby Pruett (who married George Copeland’s daughter, Margaret Rose, in 1886). According to this probate index, Shelby sold a piece of land on 23 Feb 1893 to a “Lou Ann Moore.” Here’s the page in the record book (click for larger sizes) and beneath that a close-up of this transaction. I decided to see if I could find out more about Lou Ann Moore. I discovered that she was born Lou Ann Reeves, 18 Sep 1853 in Rutherford County, Tennessee. Her parents were Thomas Bird Reeves and Louisa E. Ford. She married John W. Stephens about 1869 and they had many children, although they were apparently divorced by 1880 (or he was deceased), according to the US Federal Census for that year. 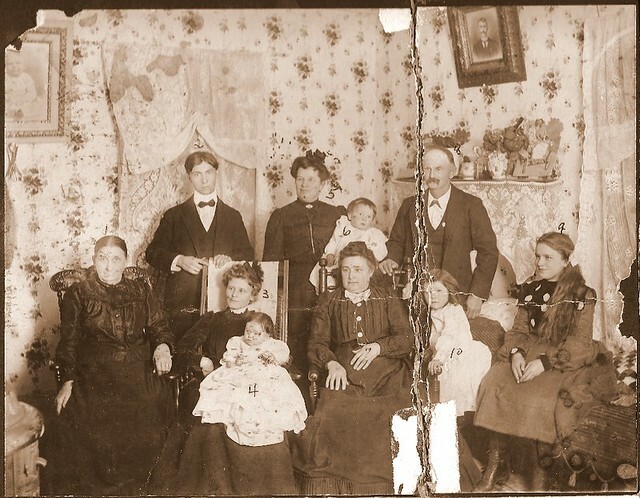 She married Charles F. Moore sometime after the 1880 Census, thus becoming “Lou Ann Moore.” Below is a photo of her with some members of her family (she is the third woman from the left who is sitting; there is a faint #7 on her hand). Lou Ann’s mother, Louisa, is all the way on the left, and Lou’s daughter, Minnie (Stephens) Sipes, is sitting down and holding the baby. There is something oddly breath-taking about seeing the face of someone who once spoke to my great-great grandfather — something I’ll never get the chance to do. 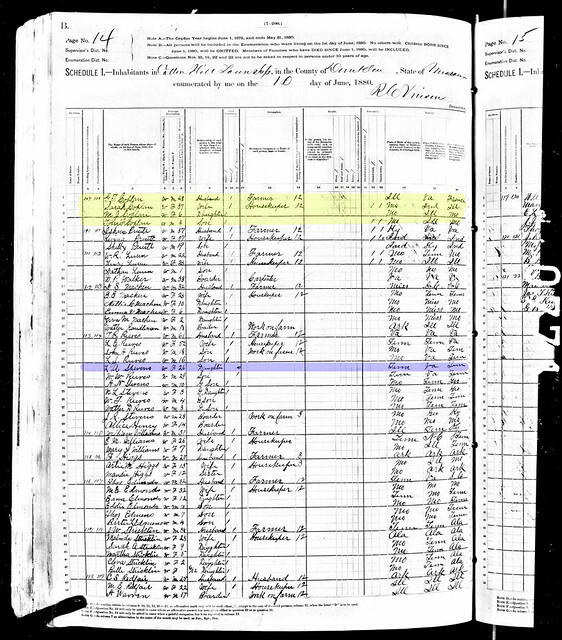 What’s interesting is that we can see Lou Ann (Reeves) Stephens living in Cotton Hill Township, Dunklin County, MO just a few houses (or properties) down from our George Copeland, his wife, and two children (including Thomas F. Copeland), on the 1880 US Federal Census. In the image below the Copeland family is yellow, and Lou Ann (Reeves) Stephens is blue. H.G. Hampton is related by marriage to Lou Ann Moore, mentioned above. He was born Hiram Grant Hampton on 28 Dec 1863 in Henderson County, Tennessee. His parents were William Hiram Hampton and Mary Emma Pope. He married Nancy Capilola Corder on 27 Mar 1889 at the home of her father, James Corder, in Dunklin County, Missouri. 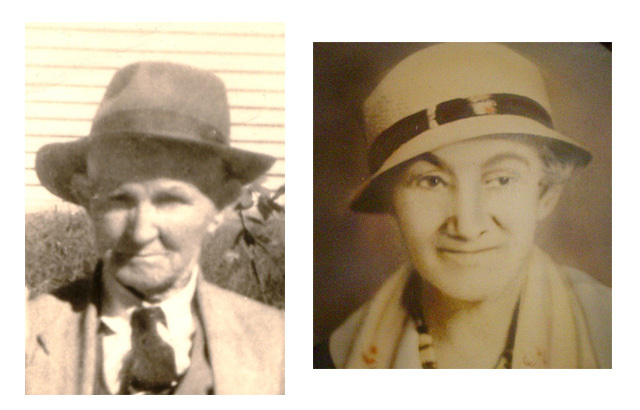 The connection to Lou Ann Moore is this: Nancy Corder’s mother was Michel Reeves, the daughter of Thomas Bird Reeves and Louisa E. Ford, and the sister of Lou Ann (Reeves) Moore. You can read more about “Uncle Tommy” (as Thomas Bird Reeves was affectionately known) and his daughters, Michel and Lou Ann, at the Reeves Project web site. Here is a picture of H.G. Hampton and his wife, Nancy Corder. Two land transactions, plus census records and other supporting documents, illustrate a web of connections between two families: Shelby Pruett (George’s son-in-law) sold land to Lou Ann Moore (George’s neighbor), while Stephen Copeland (most likely George’s nephew) sold land to H.G. Hampton, Lou Ann Moore’s brother-in-law. (I must point out that the Pruett family was also a close neighbor of the Reeves family in 1880, so this may account for the sale of land from Shelby to Lou Ann, but that does not necessarily negate the connection between the Copeland family and the Reeves family). When attempting to make a genealogical connection without any vital records, which is sadly the case for our George, every little piece of information counts. If I can connect our George to the George Copeland who lived in Ripley County during the 1850s and 1860s (and I believe I can), then I am one step closer to knowing more about his origins. Stephen Copeland, who lived alongside both our George and the George Copeland of Ripley County, is a major part of this puzzle, so discovering these land records is a key piece of evidence linking him to our family. Have I confused you all thoroughly? I hope not! This entry was posted in Copeland, Land Records and tagged copeland, dunklin county, george copeland, hampton, hiram grant hampton, land records, lou ann reeves, missouri, probate, reeves, shelby pruett, stephen copeland on January 2, 2014 by Kelli Copeland Wilson.